"How Emigrants Use Smart Phones" is an informative speech featured in the text on p. 439. Written and performed online by Mia Roberts. The following two videos are part of a collection of ten brand new videos that were professionally shot for this edition of A Speaker's Guidebook. Each video is designed to get students interested in the foundations of speech-making, and is accompanied by assignable critical-thinking questions in LaunchPad. Video Activity located in PART 3: Audience Analysis and Topic Selection; topic covered in Chapter 6. 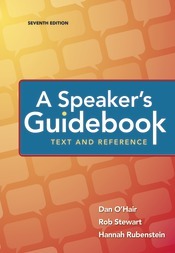 Video Activity located in PART 4: Supporting the Speech; topic covered in Chapters 8, 9, and 10.